That was my reaction when the credits rolled after the final episode of Breaking Bad. Don’t get me wrong, I thought it was a great concept, and I gave it a 7 out of 10 overall – but that was only half-way through the first series! It bewilders me that its user rating on IMDb is 9.5. The problem was that Breaking Bad really was bad, at least in relation to its potential. The writers and production team took a great concept and turned it into a kitchen sink drama without the likeable characters, humour, excitement and pathos that any good drama needs. Let’s start with the positives. The concept of making a show about a high school chemistry teacher who decides to cook meth when he finds out he has terminal cancer in order to provide for his family was a good one. It had the potential to create all kinds of opportunities for black humour and excitement as the hero lived a double life and tried not to get caught. Unfortunately, the writers ignored the other parts of the formula that generally controls what makes a good TV series. First of all, the main characters have to be likeable. Now, some characters worked well. Hank was initially presented as a racist redneck, but we learned to respect and even like him once we got to know him. Todd also benefited from being cast against type. He seemed to be a dutiful and polite underling who knew his place in the hierarchy and wanted to improve himself, but he soon showed himself capable of unthinking acts of violence and brutal treachery. Unfortunately, the hero Walter White, his assistant Jesse and his wife Skyler and son Junior were just not likeable enough. If viewers are expected to devote more than 45 hours of their lives to watching more than 60 episodes, the least they should be able to ask for is a cast they want to watch. Walter’s only redeeming quality is that he was supposed to be committing all his crimes on behalf of his family, but it was a family that didn’t appear to deserve his generosity. Junior was a nagging annoyance who was never really fully developed, and Skyler was the worst example. Walter loved her, and we were obviously meant to understand that love and even feel a little of it ourselves, but her character oscillated madly (and implausibly) between saint and sinner, housewife and brazen criminal and tramp. When she went out on the street to chase after Walt after he had taken her baby, I couldn’t even be bothered to look up from playing Tetris on my iPhone! I was glad she had to suffer. Now, was that what I was supposed to think? Had I been cleverly inserted into the head of Walter? Was I identifying with him in his enraged and vengeful state? If only. The casting didn’t help, either. People may complain that US TV dramas are peopled almost exclusively from the modelling agencies of New York and LA, but the studios do that for a reason. It may not be very realistic, but people like to watch beautiful people on screen. It’s a short cut to the kind of emotion that we were meant to feel (but didn’t) towards Skyler. The only good-looking actor or actress on the show was Krysten Ritter, who played the part of Jane, and she was killed off after only 10 episodes. It’s no coincidence that we wanted her romance with Jesse to survive, whereas we couldn’t have cared less about the Whites’ marriage. To understand what I mean, let’s have a look at another similar show based on a similar concept. Dexter is based on the idea that a blood spatter analyst by day is a serial killer by night, and it’s given an intriguing twist by the fact that his sister is a homicide detective in the same city of Miami. The casting here is perfect. Michael C Hall plays Dexter, and Jennifer Carpenter is his sister. They make an attractive couple – attractive enough to have been married once in real life! – and Dexter’s wife is played by Julie Benz, another attractive blonde. The differences in casting and character allow the audience to relate to Dexter in a way that’s not possible in Breaking Bad. You might think it should have been impossible to relate to a psychopath, but Dexter’s character has apparently been softened over time, perhaps because the writers realised the audience would never warm to someone who never felt emotion towards anyone. Smart choice. Matt Groening realised the same thing when Homer replaced Bart as the star of The Simpsons and was rewarded with a softer voice and a more cuddly image. Another way in which Dexter scores over Breaking Bad is in the script, which is inevitably episodic but tries to take advantage of all the opportunities for black humour afforded by Dexter’s double life. The voiceover helps. We can then hear the viewpoint of a serial killer even while we watch his pretended reactions. For some reason, Breaking Bad largely avoids making us laugh. There are a few giggles at the expense of Hank or Skinny Pete and Badger, but – again – it’s a story of wasted potential. Of all the opportunities writers could be given for black humour, this was surely the best the writers would ever see, and yet they can’t bring themselves to inject any delicious double meaning into any of Walter’s or Jesse’s comments on the game they’re playing. Even Shakespeare saw the potential in the gatekeeper scene in Macbeth. If he saw Breaking Bad, he’d be tearing his hair out! Altogether, my main complaint about Breaking Bad is the lack of emotion, whether in terms of our reaction to the characters, the lack of humour or the absence of real excitement or pathos. Some episodes do hit the heights, but they only show up what is all too often missing. Series 5 Episode 5 (“Dead Freight”) is the prime example. Suddenly, we are on Walter’s side, as we desperately hope he manages to pull off the rail heist. That kind of guilty pleasure is par for the course on Dexter as we pray he escapes to kill another day, but it’s largely absent from Breaking Bad. The moment in the following episode when Walter demands: “Say my name!” is a sadly rare example of a scene that is gripping, spell-binding and hair-raising as Walter reaches his apotheosis as a drug lord. However, the mythic power of the name ‘Heisenberg’ is never exploited to its true potential, and our heart strings are generally left untugged at. That is largely due to our lack of sympathy for the characters. Why should we feel any suspense or excitement when we don’t care what happens to them? The other consequence of our lack of sympathy is any kind of emotional engagement during the finale. 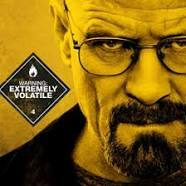 The final episode should have been a chance to sum up what the series was all about, show the inevitable consequences of the hero’s ‘vaulting ambition’ and yet still move us to tears as he gets his comeuppance, but Walter White was doomed from the start, and Jesse gets away scot free! In sum, Breaking Bad ‘coulda woulda shoulda’ been a contender. It had all the makings of one of the great TV dramas but ended up unaccountably not following the recipe. We may say we don’t like ‘formulaic’ Hollywood dramas, but the viewing figures don’t lie. Give us high-concept drama with likeable heroes, deadpan humour and emotional climaxes, and we’ll glue our keesters to the bleachers. This entry was posted in Film and tagged Breaking Bad, review, series, show, TV on October 14, 2013 by Nick Dale.